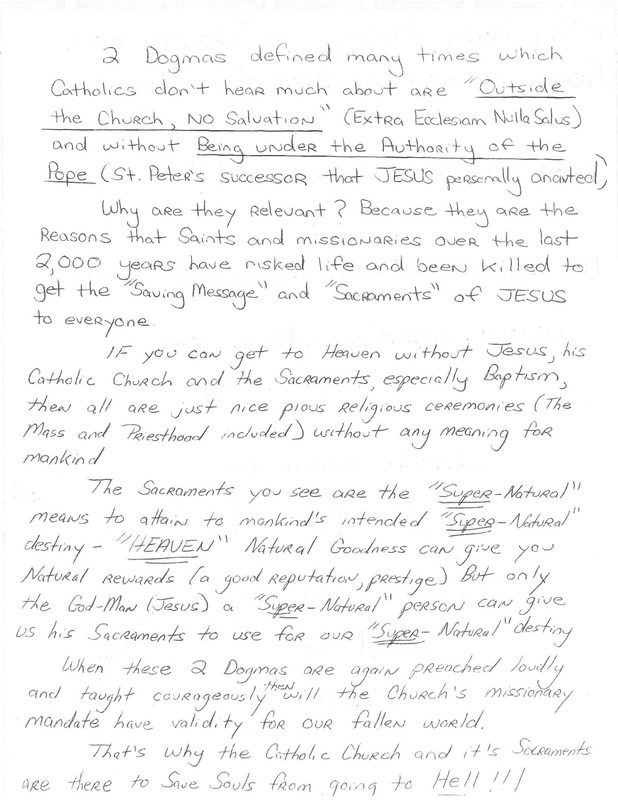 To the Feeneyite who sent me the following letter insisting that there is “no salvation outside the Church” (extra ecclesiam nulla salus). That is, there is no salvation outside of the Roman Church established by Jesus Christ and the only means into that Church is by baptism. What exactly this teaching means is often misunderstood when it is isolated from the entirety of Christian doctrine. The Catechism of the Catholic Church explains this teaching simply: “it means that all salvation comes from Christ the Head through the Church which is his Body" (CCC 846). In brief, though the Church in the world is the sacrament of salvation, God Himself is by no means limited by what He institutes. The ordinary means of salvation might be through the Church properly speaking, God can -- doing what He sees as fit by means of His omnipotence and omnibenevolence -- save others that are not a part of the Roman Catholic Church. Certainly, those of the Roman Catholic faith do have an easier means at which to attain salvation, provided they take advantage of all that Christ and God offered and established, than those outside of the Catholic Faith. It must be remembered that the Church makes no official declaration on who is not saved. For we do not know for certain whether or not a person who preformed evil acts while alive is indeed in Hell or if they had a flash of repentance with their dying breath and accepted the grace of God. The Church only makes proclamations on who is in Heaven and even then it is rare and only after a long process. Very solid response and right in line with what the Church teaches. The Italian diocesan priest Fr. Francesco Giordano studying at the Holy Cross University, Rome and working for his doctorate on the subject extra ecclesiam nulla salus says he affirms the dogma Cantate Domino, Council of Florence 1441.The ex cathedra dogma says all non Catholics, specifying, Jews, Protestants and Orthodox Christians needing to formally enter the Catholic Church to avoid Hell, which has fire. One can affirm Cantate Domino which indicates everyone with no exception, de facto needs to enter the Church and, at the same time believe de jure; in principle, a non Catholic can be saved implicitly (baptism of desire etc) and it would be known only to God. However Fr. Giordano’s position on 1) Fr. Leonard Feeney and 2) Lumen Gentium 16, Vatican Council II is not clear. He seems to contradict the dogma on these two points. Though, he told me at the Church Santa Maria di Nazareth, Boccea, Rome that he affirms Cantate Domino. Fr. Giordano, who has studied at the University of Chicago, is a young priest fluent in English and Italian. He received his Licentiate from the University of St. Thomas Aquinas, Rome and the subject of his thesis there was outside the church there is no salvation. Like St. Thomas Aquinas if one uses the defacto-dejure analysis it is possible to hold the ‘rigorist interpretation’ of the dogma and also affirm the baptism of desire (Council of Trent) and so not be considered a heretic. It does not have to be an either-or position i.e. the dogma extra ecclesiam nulla salus or the baptism of desire. Fr. Giordano believes Cantate Domino is compatible with Vatican Council II, Catechism of the Catholic Church and other Magisterial documents. St. Thomas Aquinas affirms the ‘rigorist interpretation’ of extra ecclesiam nulla salus. St. Thomas also says that there can be the man in the forest in invincible ignorance. 1. So de facto everyone on earth needs to enter the Church for salvation an there are no exceptions.De jure (in principle) there can be a person in invincible ignorance who can be saved. Here we have no contradiction of the Principle of Non Contradiction. De facto everyone on earth needs to enter the Church for salvation but there are de facto exceptions that we can know of (invincible ignorance etc). So everyone needs to enter the Church except for ….This is a contradiction of the Principle of Non Contradiction and irrational (defacto-defacto) .It is the political position of the secular media and the Angelicum, Gregorian and Opus Dei University in Rome. Fr. Giordano agrees with the first (1) interpretation of St. Thomas Aquinas and extra ecclesiam nulla salus. However is he free to express it in his doctorate? It would mean Lumen Gentium 16 does not say that we know of cases of non Catholics saved in the present times in invincible ignorance. If the Lumen Gentium text does not make this claim and rationally we cannot know any such case, then Vatican Council II does not contradict Cantate Domino - and we are back to the centuries-old interpretation. Would the Opus Dei University accept this doctoral thesis? We do not know any case of a person saved in invincible ignorance or the baptism of desire (BOD). We don’t know any specific case. So we can accept BOD and invincible ignorance only in principle. We can know it only as a concept. We can never know any such case in reality. We cannot meet someone who has been saved with BOD or in invincible ignorance. So it is never de facto; real, as is the baptism of water. The baptism of water is repeatable and visible. It is de facto. So when we refer to the baptism of desire it is always de jure (in principle, acceptable). It can never be known in reality. So de facto Catholic Faith and the baptism of water are needed for all for salvation, with no exception. While de jure, in principle, there can be persons known to God only who can be saved with the baptism of desire or invincible ignorance (in the manner known to God). So affirming the baptism of desire etc does not conflict with the interpretation of EENS according to Fr. Leonard Feeney. Fr.Leonard Feeney taught de facto everyone with no exception needed to enter the Church for salvation and de facto or de jure we do not know any case of the baptism of desire. There is no de facto or de jure baptism of desire (implicit salvation) that we can know of as humans. It is never de facto and so never in conflict with the dogma. There can be a baptism of desire de facto known to God but it can never be defacto for us. So the baptism of desire can never be known de facto and can only be accepted in principle I repeat. Since it can never be defacto known to us it does not oppose the dogmatic teaching. Since one accepts it in principle; as a possibility, one cannot be called a heretic. I cannot be called a heretic for rejecting the baptism of desire. I do not. I accept it in principle as a possibility known de facto only to God.Neither can I be called a heretic for affirming Cantate Domino. Since it refers to de facto everyone needing Catholic Faith and the baptism of water the same as Ad Gentes 7 and it is not in conflict with the Council of Trent's reference to the baptism of desire(implicit and dejure). Since one is defacto and the other de jure it does not contradict the Principle of Non Contradiction as would a defacto-defacto irrational analysis. We cannot know any case of implicit salvation i.e. baptism of desire, invincible ignorance, good conscience, partial communion with the Church as it is never de facto known to us. So it is not opposed to the dogma which indicates everyone needs to de facto enter the Church for salvation. The dogma says everyone with no exception needs to be a formal, de facto member of the Church for salvation. Everyone de facto needs Catholic Faith and the baptism of water to go to Heaven and avoid Hell. Probably if Fr.Giordanao knew the truth on this subject and wrote it in his thesis , the Angelicum would not permit him to receive a Licentiate. They would not even approve the subject for ‘research’. At the Opus Dei University Fr. Francesco has chosen a seemingly harmless aspect of outside the Church the church there is no salvation. He will focus on a specific time period of the dogma and with reference to St. Thomas Aquinas. Imagine him telling the professor at the Angelicum that the Letter of the Holy Office 1949 supported Fr. Leonard Feeney on doctrine. The Letter referred to the ‘dogma’. The text of the dogma, Cantate Domino above, has the same message as Fr. Leonard Feeney; the Church teaches ‘infallibly’ that all Jews in Boston need to convert into the Church to avoid Hell. So how could Fr. Leonard Feeney could be excommunicated for heresy as the media and the Angelicum claim? Would they allow him to continue ? Imagine him telling the professor at the Angelicum that there is no text in Vatican Council II which contradicts Cantate Domino. Even now at the Holy Cross University can he challenge his professors to point out any text in Vatican Council II which contradicts Cantate Domino? Similar errors as at the Angelicum are also being taught at the Opus Dei University. He could have to provide ‘research’ which is politically acceptable. They say there is no baptism of desire. They are correct there is no known case of a person saved with the baptism of desire. De facto in reality we don’t know any such case. So in this sense the vague phrase’ there is no baptism of desire’ is correct. However in its nature, the baptism of desire can never be defacto for us. In its very nature, since it is known only to God; there is no de facto d baptism of desire for us. It is only de facto for God and for us humans a concept, a possibility, acceptable in principle (de jure). So the Most Holy Family Monastery(MHFM) reject the baptism of desire since they assume it is de facto and so contradicts the dogma Cantate Domini. It would be contrary to the principle of Non Contradiction for the MHFM’s Dimond Brothers to accept a baptism of desire, which is, defacto for them. They must realize that the baptism of desire can never be known de facto and since it is dejure, known only to God, it does not contradict the Principle of Non Contradiction. So I can affirm Cantate Domino and also the baptism of desire (de jure, a possibility). This is not heresy as the MHFM would claim, since in principle I accept the possibility of a person being saved with the baptism of desire. How does the Franciscan Friars of the Immaculate at Boccea, where Fr. Francesco lives, respond to this issue? Fr. Francesco offers the Tridentine Mass at the Church there and often hears Confession. The Parish Priest is Fr. Settimo Manelli FFI (Tel: 06-6156091 06-6156091 E-mail: santamariadinazareth@gmail.com ).I have been sending some of these posts on this blog, to Fr.Settimo and to Fr. John Francesco FFI, an American priest of the community who also lives at Boccea. Here there are some 30 Friars many of whom study Philosophy at the seminary in Boccea.They are taught by Fr. John Francesco and the other FFI priests. I would like them to answer these four questions about the Catholic Faith. 1. Do they hold to the ‘teachings ‘of the Church according to the media (New York Times, Boston Globe, Reuters etc) or according to Magisterial texts, on the subject of extra eccleisam nulla salus? 2. Do they interpret Vatican Council II and Fr. Leonard Feeney as an exception to Cantate Domino or do they see Vatican Council II (Ad Gentes 7) and the Letter of the Holy Office to the Archbishop of Boston 1949, affirming Cantate Domino? 3. There can be no Tridentine Rite Mass without extra eccleisam nulla salus. To reject an ex cathedra dogma, in the name of Vatican Council II or whatever is heresy. It’s a mortal sin ? 4. Can we personally know cases of non Catholics saved in the present times with a good conscience, the Word of God, in partial communion with the Church etc? Fr. Francesco Giordano who lives with the Franciscan Friars of the Immaculate at Boccea affirms Cantate Domino and the baptism of desire. So he cannot be called a heretic. This has been a sad controversy in the Church. He affirms Cantate Domino and Vatican Council II. I am sure other priests will also follow him. An Italian priest who offered the Novus Ordo Mass in Italian today morning at the Salus Populi Romani chapel in the Basilica of St. Mary Majors, Rome, said it was a mortal sin to deny an ex cathedra dogma like the Immaculate Conception of Our Lady or extra ecclesiam nulla salus. Fr. Gabrielle said it was a sacrilege to receive the Eucharist in this condition without first going for Confession. He was speaking with me in the sacristy after Mass and will be here for a few months. I told him I write on this subject on my blog. The dogma extra ecclesiam nulla salus (outside the church there is no salvation) says everyone with no exception needs to be a formal member of the Catholic Church for salvation. He agreed this was the teaching of the dogma and of the Catholic Church. Every non Catholic needs to enter the Church for salvation." If there is no baptism there is no salvation ",said Fr. Gabrielle.It needs to be mentioned that Catholics only give the baptism of water to adults with Catholic Faith (Ad Gentes 7). Vatican Council II also says Fr. Gabrielle said that there can be those saved through Jesus and the Church and who may not be members of the Church. It needs to be clarified here that only God knows which non Catholics are saved through Jesus and the Church. So this does not contradict the dogma extra ecclesiam nulla salus. Fr. Gabrielle had earlier during the homily spoken about St. Maria Goretti. He also mentioned in the homily that fornicators, or someone who committed a sin of impurity, should not receive the Eucharist, without going for Confession otherwise it would be a sacrilege. Basing itself on Scripture and Tradition, the Council teaches that the Church, a pilgrim now on earth, is necessary for salvation: the one Christ is the mediator and the way of salvation; he is present to us in his body which is the Church. He himself explicitly asserted the necessity of faith and Baptism, and thereby affirmed at the same time the necessity of the Church which men enter through Baptism as through a door. Hence they could not be saved who, knowing that the Catholic Church was founded as necessary by God through Christ, would refuse either to enter it or to remain in it.-Catechism of the Catholic Church 846 (Note : ‘which men through Baptism as through a door’ was a term used by the Church Fathers for the rigorist interpretation of outside the church there is no salvation). This doctrine must not be set against the universal salvific will of God (cf. 1 Tim 2:4); “it is necessary to keep these two truths together, namely, the real possibility of salvation in Christ for all mankind and the necessity of the Church for this salvation”.-Dominus Iesus 20 (Note: Salvation is open for all however to receive this salvation they need to enter the Church). Vatican Council II says outside the Catholic Church there is no salvation. Extra ecclesiam nulla salus. The Catholic Church teaches after Vatican Council II (1965) that all people need to enter the Catholic Church to go to Heaven (Ad Gentes 7, Vatican Council II). Catholic Faith with the Baptism of water is the normal, ordinary way of salvation for all people (Lumen Gentium 14, Vatican Council II).The Catholic Church is the ordinary way of salvation for all people (Lumen Gentium 14).Non Catholics however can be saved through the extraordinary means of salvation (Lumen Gentium 16).Only God knows who are the non-Catholics saved through the extraordinary means of salvation; the exceptions. We do not know who the exceptions are. We cannot judge. Jesus, the Church, Scripture and Vatican Council II indicate that the priority is Catholic Faith and the Baptism of water for all people. So everyone needs to enter the Catholic Church which is the like the only Ark of Noah that saves in the Flood (CCC).Non Catholic religions have good things in them. However they are not paths to salvation. All salvation comes through Jesus and His Mystical Body the Church. Those non-Catholics who know the above information and yet do not enter the Church are oriented to Hell (Ad Gentes 7, Lumen Gentium 14).Those non-Catholics participating in inter religious dialogue, are educated. They know. They are oriented to Hell. Outside the Church there is no salvation. Catholic Faith and the Baptism of water are needed for all people. This is Vatican Council II. No where in Nostra Aetate, Vatican Council II is it said that non Catholic religions are paths to salvation. Vatican Council II is in harmony with John 3:5, the Church Fathers, Council of Florence, Evangelii Nuntiandi, Redemptoris Missio, Catechism of the Catholic Church, Dominus Iesus, Congregation of the Doctrine of the Faith, Notification on Fr. Jacques Dupuis etc. Don’t let people fool you about Vatican Council II. Check the details and affirm the Faith which does not change. Religious students at the University of St. Thomas Aquinas, Rome are invited annually by the Angelicum to choose a thesis. One of the options available is the subject ‘outside the church there is no salvation’. Bro. Benedict, from Kerala, India is the Priest In charge at the Missionaries of Charity Contemplative Men’s house in Rome.He chose this subject. It was approved by the moderator. Bro. Benedict received his theology degree from the Angelicum. The moderator approved his thesis since he repeated the liberal lie that Fr. Leonard Feeney rejected the possibility of non Catholics being saved with the baptism of desire and invincible ignorance. and that he held the ‘rigorist interpretation’ of the dogma outside the church there is no salvation. The students do not ask in their thesis how could Fr. Leonard Feeney be excommunicated for holding the same position as the popes, the saints, the Church Fathers and the dogma itself? The dogma thrice defined by three Councils does not mention non Catholics being saved in invincible ignorance or the baptism of desire. So Fr. Leonard Feeney did not say anything different. How can being saved in invincible ignorance the baptism of desire be an exception to the dogma when we do not know any such explicit case in the present times. Where is the magisterial text which refers to these cases as being explicit and so contradicting the dogma; contradicting the ‘rigorist interpretation’ of the dogma? Where does Vatican Council II refer to non Catholics being saved explicitly and in known cases in invincible ignorance, the baptism of desire, a good conscience, in partial communion with the Church and by the Word of God? Where does the Letter of the Holy Office of Pope Pius XII say that Fr. Leonard Feeney was excommunicated for heresy and not disobedience ? Did not the Letter of the Holy Office refer to ‘the dogma’, ‘the infallible statement’ and does not the dogma indicate that all non Catholics in Boston and the rest of the world need to convert visibly into the Catholic Church for salvation? Was this not exactly what Fr. Leonard Feeney preached? If we do not know of any explicit case of someone being saved with the baptism of desire etc then how can we expect Fr.Leonard Feeney to claim that these are exceptions to the dogma? Can this really be the teaching of the Catholic Church as stated by the secular media when the magisterial texts say otherwise ? Similarly Fr. Francesco Giardano, an Italian Diocesan priest had the present Rector of the Angelicum University as his moderator. He mentioned Fr. Leonard Feeney extensively and with the same errors. He was granted a Licentiate degree by the Angelicum. NORMS FOR THE TRIDENTINE RITE MASS VIOLATED ? a.) Every Catholic priest who is not impeded by Canon Law 7 is to be considered idoneus (“qualified”) for the celebration of the Holy Mass in the forma extraordinaria.- Universae Ecclesiae, ECCLESIA DEI, Instructionon the application of the Apostolic Letter Summorum Pontificum of HIS HOLINESS POPE BENEDICT XVI given Motu Proprio30 April, 2011, Cardinal William Levada, Prefect, Congregation for the Doctrine of the Faith, Vatican. The Tridentine Rite Mass is offered by the Catholic priests at the Church Santa Maria di Nazareth, Boccea,Rome but they deny in public the dogma extra ecclesiam nulla salus. They also assume that those saved in invincible ignorance and the baptism of desire are exceptions to the dogma. This is an impediment to their offering Holy Mass since in public a priest rejects an ex cathedra dogma or other teachings of the Catholic Church, which it is necssary to firmly believe in e.g Dominus Iesus 20, Vatican Council II LG 14,AG 7 etc . Fr. Tissa Balasuriya OMI was excommunicated for rejecting the dogma of the Immaculate Conception of Our Lady. Last month the Rector of the Church of Santa Maria di Nazareth spoke at a conference organised by the Franciscan Friars of the Immaculate on the importance of the dogma of the Assumption of Our Lady. Yet he and other priests will not affirm the dogma of extra ecclesiam nulla salus . They will also assume it is contradicted by Vatican Council II (LG 16). Vatican Council II does not oppose the centuries old interpretation of the dogma outside the church there is no salvation. Daphne McLeod yesterday (Oct.25,2011) said that the possibility of non Catholics saved in invincible ignorance or with the baptism of desire does not contradict the dogma extra ecclesiam nulla salus. In an e-mail received yesterday (1) she also said that she had read the reports I sent her especially with reference to the Society of St. Pius X (SSPX) and extra ecclesiam nulla salus. She agrees that those saved in invincible ignorance and the baptism of desire do not contradict the dogma which tells us that every one needs to convert into the Church for salvation. She said she accepts the possibility of non Catholics being saved in invincible ignorance and the baptism of desire (http://eucharistandmission.blogspot.com/2009/10/catholic-church-teaches-muslim-in.html#links). However it is understood that these cases are known only to God.Non Catholic religions are not paths to salvation and their members need to enter the Catholic Church to avoid Hell. This is the teaching of the Catholic Church before and after Vatican Council II. She is affirming the dogma which Pope Pius XII called ‘the infallible teaching’ (Letter of the Holy Office 1949).This was the interpretation of the Church Fathers, it was defined at three Church Councils, repeated in the ordinary magisterium of the popes, taught by numerous saints and included in Vatican Council II (LG 14,AG 7). Daphne McLeod who has taught for forty years in Catholic Junior and primary schools, daily teaching Religious Education is telling us that all the non-Catholic participants at the Assisi interfaith meeting tomorrow are oriented to Hell and there are no exceptions. This is the official teaching of the Catholic Church according to Magisterial texts. Daphne McLeod has been a member of the Catholic Evidence Guild, and friend of Frank Sheed and Maisie Ward, she spoke regularly at Speaker’s Corner in Hyde Park. The Chairman of Pro Ecclesia et Pontifice, U.K says that non Catholic religions, including those of Protestants and Orthodox Christians are not paths to salvation (Cantate Domino, Council of Florence 1441, Vatican Council II LG 14, AG 7 etc). All non Catholics participating at the Assisi inter faith meeting are lost forever at the time of death unless they convert into the Church. This is not just her personal opinion but it has always been taught by the Catholic Church. ARCHBISHOP MARCEL LEFEBVRE CALLED "TO PREACH" THE RIGORIST INTERPRETATION OF "EXTRA ECCLESIAM NULLA SALUS"
DAPHNE MCLEOD COMMENT A BOMBSHELL FOR ENGLISH BISHOPS? The Church teaches after Vatican Council II that all the non Catholic participants at Assisi today are oriented to Hell and there are no exceptions. Daphne McLeod is not playing the Lumen Gentium 16 game and the bishops should have noticed it. Her comments are on the internet and English bloggers could be picking it up by now. She has united the Catholic traditionalist movement and pointed to a major cause of dissent and confusion in the Catholic Church. She has brought the explicitly-implicit baptism of desire non-sense out in the open and to the attention of Catholics. She has not repeated the meaningless mantra ‘except for those in invincible ignorance and the baptism of desire’. She has not fallen for the LG 16 ruse of the liberals. We cannot meet anyone on the street saved with the baptism of desire, in invincible ignorance, a good conscience, ‘who has not had the Gospel preached to him through no fault of his own’, saved in partial as compared to full communion with the Church. It is only God who can judge who ‘knows’ about the Church and yet does not enter and who is in invincible ignorance. The dogma outside the Church there is no salvation and Vatican Council II (LG 14,AG 7) tell us that everyone needs to convert into the Catholic Church; to enter with Catholic Faith and the Baptism of water. The exceptions do not make the rule. The exceptions are not the ordinary means of salvation. The ordinary means of salvation is Catholic Faith and the baptism of water (Redemptoris Missio 55, Lumen Gentium 14, Ad Gentes 7).Most important, the exceptions are only hypothetical, they are not de facto exceptions to the dogma. It’s true that all who are saved are saved through Jesus and the Church and this teaching does not contradict the dogma i.e. it is necessary that everyone enter the Church with no exceptions. False reasoning assumes we are God and can judge. We reason that billions are oriented to Hell because this is the teaching of the Church. It is only the Catholic Church that has the ‘fullness of the truth’ and is the only moral authority. It is this Church which has been guided by the Holy Spirit to proclaim consistent teachings since the time of Jesus and the Apostles until today. The ‘great religions’ are false paths to salvation. English bishops use an interpretation of Magisterial texts which contradict the Principle of Non Contradiction as taught to Catholic seminarians. It is assumed by the bishops that those saved among Christians and non Christians, in invincible ignorance, the baptism of desire, a good conscience, with ‘the seeds of the Word’ or in imperfect communion with the Church, are known to us in the present times and this is the ordinary way of salvation. They imply that this is an exception to the dogma outside the Church there is no salvation. 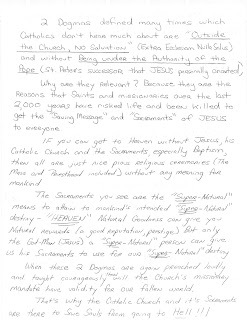 So Protestants just have to believe in Jesus and they are saved in their religion through this ordinary means.This is a rejection of the dogma extra ecclesiam nulla salus and Vatican Council II (Lumen Gentium 14, Ad Gentes 7).Vatican Council II indicates that the ordinary means of salvation is Catholic Faith and the baptism of water (LG 14, AG 7). De facto every one needs to be an explicit, visible member of the Church of salvation and defacto non Catholics in invincible ignorance and the baptism of desire can be saved without the baptism of water. De facto all people need to enter the Catholic Church with the baptism of water and Catholic Faith for salvation. (Vatican Council II, Lumen Gentium 14, Ad Gentes 7). De facto some people can be saved in invincible ignorance. (Lumen Gentium 16). De facto all people need to enter the Catholic Church with the baptism of water and Catholic Faith for salvation. (Vatican Council II, Lumen Gentium 14,Ad Gentes7). De jure some people can be saved in invincible ignorance. (Lumen Gentium 16). Due to the contradiction in the interpretation young candidates with a religious vocation in England have to say everyone needs to enter the Church for salvation in the present times but there could be defacto exceptions like those saved with the baptism of desire. The baptism of desire is assumed to be visible and so is an exception to the dogma.The dogma indicates everyone needs to be an explicit, visible member of the church to go to Heaven. If the baptism of desire was implicit for candidates it would not contradict the dogma, it would not be an exception. Since it is allegedly explicitly known, it is an exception to the dogma. It is an error for the bishops to interpret those saved with the baptism of desire as being de facto known to us. Candidates with a religious vocation in England would also have to accept that Fr. Leonard Feeney was ‘condemned’ for holding the same view as the popes, including Pope Pius XII, who referred to 'the dogma', the saints and the dogma itself. Since the bishops assume that Fr.Leonard Feeney said that there are no exceptions to the dogma and that the baptism of desire etc are not exceptions. For the bishops the baptism of desire is defacto and explicitly known to us and so Fr.Leonard Feeney was wrong. So were the popes and saints. (a) No one knows of a particular case of someone being saved with the baptism of desire even though it is being assumed as being visible (b) Fr.Leonard Feeney was not excommunicated for repeating the same teaching of the popes, Councils, saints and the thrice-defined dogma extra ecclesiam nulla salus. They were all saying that de facto every adult needs Catholic Faith and the baptism of water for salvation. They did not consider the baptism of desire as explicit but knew that it was always implicit. They imply that Vatican Council II has changed our concept of Church since those saved in invincible ignorance (LG 16) etc are visible and de facto known to us in the present times. This is false. The letter refers to the dogma and indicates that de facto everyone needs to enter the Church and it also mentions that de jure a non Catholic can be saved with the baptism of desire. The Letter was critical of the Archbishop of Boston who indicated that those saved with the baptism of desire are defacto cases, known and visible. The Letter supports Fr. Leonard Feeney on doctrine. For the baptism of desire to be an exception to the dogma outside the church there is no salvation it would have to be visible and known. Implicit unknown to us baptism of desire is not an exception to the dogma which indicates every one must me a visible member of the Church. The Letter mentions 'the dogma', 'the infallible statement' and affirms the baptism of desire. It does not imply that the baptism of desire is an exception to the dogma since the baptism of desire is always implicit .God accepts an implicit desire he can also save someone in implicit invincible ignorance. So implicit baptism of desire or invincible ignorance cannot be an exception to the dogma. The dogma refers to all people needing to defacto enter the Catholic Church for salvation. There are those who are members of the Church as taught by the dogma and there are those who are united to the Church only by desire. They are defacto members who have Catholic Faith and have received the baptism of water. Those who have received the baptism of desire are de jure in principle united to the Church only by desire. These cases are known only to God. The Letter of the Holy Office during the pontificate of Pope Pius XII was addressed to the Archbishop of Boston Cardinal Richard Cushing directly and not to Fr. Leonard Feeney. It was because the Archbishop of Boston and the Jesuits, who implied wrongly, that these cases could be exceptions to the dogma and to Fr. Leonard Feeney. It was the Archbishop who believed like the Jesuits at Boston College that every one with no exception does not have to enter the Church for salvation. The Archbishop believed that there could be non Catholics saved with the baptism of desire or in invincible ignorance. Implying, of course, that these cases are visible, explicit and known to us and so are an exception to the dogma. The Letter affirms ‘the dogma’ as did Fr. Leonard Feeney. The dogma does not mention any exceptions and neither does Fr. Leonard Feeney. The Letter seems to refer to the issue of the baptism of desire being implied as an exception to the dogma. It is only in reference to the error of the Archbishop and the Jesuits at Boston College. The Letter like Vatican Council II and other magisterial documents uses the defacto- dejure analysis. The Archbishop and the Jesuits used the clumsy defacto- defacto analysis and contradicted the Principle of Non Contradiction. How could they imply that everyone de facto needs to enter the Church for salvation but some people do not de facto need to enter the Church ?! To imply that the thrice defined dogma extra ecclesiam nulla salus has visible exceptions is heresy. It is a rejectiion of the dogma as it was interpreted for centuries. It is creating a new doctrine. This error of the visible baptism of desire being a defacto exception to the dogma and Fr. Leonard Feeney is being maintained by the United States Conference of Catholic Bishops (USCCB) in the Fr. Peter Phan Notification. They have used the mantra ‘except for those in invincible ignorance and the baptism of desire’. The error is also held on the websites by the Conference of Catholic Bishops of England and Wales (CCBEW) ,Catholic Answers, Catholics United for the Faith and so many other Catholics. They assume innocently that the baptism of desire is an exception to the dogma. They wrongly imply that this was taught by Pope Pius XII. DID THE CARDINAL WHO ISSUED THE LETTER OF THE HOLY OFFICE 1949 ASSUME THAT THE BAPTISM OF DESIRE WAS VISIBLE AND AN EXCEPTION TO THE DOGMA ? He assumed the baptism of desire was visible and so contradicted the dogma outside the church there is no salvation. He assumed that those saved with the baptism of desire and in invincible ignorance were known to us and so it contradicts Fr. Leonard Feeney’s traditional interpretation of the dogma extra ecclesiam nulla salus. Since the time of the Archbishop Cardinal Richard Cushing it is assumed there are two interpretations of the dogma. 1)the rigorist interpretation of Fr. Leonard Feeney, the popes and saints and 2) the non rigorist interpretation. The non rigorist interpretation says everyone needs to enter the Church for salvation except for those in invincible ignorance and the baptism of desire. It is assumed here that the baptism of desire and invincible ignorance are exceptions to the dogma. So this is a ‘new ‘interpretation. We now know that there is only one interpretation of the dogma, the centuries old interpretation since the baptism of desire and invincible ignorance are not known to us. It is assumed that Vatican Council II, Lumen Gentium 16 (invincible ignorance, good conscience) is an exception to the dogma. This would be assuming that those saved in invincible ignorance are defacto known to us in particular cases. We know that they are not visible and explicitly known to us but known only to God. So they are not exceptions to the dogma. De facto everyone needs to enter the Church for salvation. De jure in principle those saved in invincible ignorance and the baptism of desire are known only to God. The baptism of water is explicit. The baptism of desire is implicit. The Letter of the Holy Office 1949 was addressed directly to the Archbishop of Boston. It was critical of the Archbshop. It mentioned ‘the dogma’, the ‘infallible statement’. The dogma does not mention any exceptions. The dogma also indicates, like Fr. Leonard Feeney, that everyone needs to explicitly enter the Church for salvation. Today the USCCB (United States Conference of Catholic Bishops), Eternal Word Television Network, Catholic Answers, Society of St. Pius X, Pontifical seminaries and universities, sedevacantists, priests, nuns and lay Catholics are all unknowingly following the legacy of the Archbishop of Boston and the Jesuits of Boston College. They assume the baptism of desire etc is visible and so is an exception to the dogma. I have an idea! The first commandments is "Thou shalt have no other gods before me". If I remember correctly God was supposed to lead the non-Catholics by conscience and they were supposed to follow conscience for their salvation. God-given consciences reject sin. Idolatry is a sin. For non-Catholics because of the conscience they would have to stop worshiping named gods and instead believe in an unknown god. Then they would not be pagan because pagans by definition believe in false Gods. The people on their way to salvation would believe in the existence of god but not accept any of the current pagan gods. The current Code of Canon Law says heresy is post baptismal DENIAL. If they were never baptized they can't be heretics. Also, they could just be in a state of confusion not rejection. The Code of Canon Law states that schism is a REFUSAL of submission to the Roman Pontiff or of communion with the members of the Church subject to him. If they didn't know it was offered to them or of it's existence they could not have even made the decision to refuse.